A special thanks to my sister Julie for her contribution to today's photos. View of the drive to the Kilauea Lighthouse when it was closed. 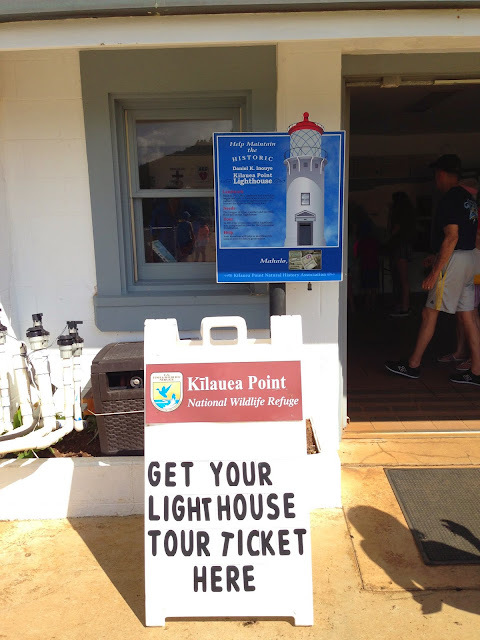 On several occasions we've made our way to the Kilauea Lighthouse and Wildlife Refuse only to be put off by the crowds. The scenery surrounding the area is beautiful with birds of many species making this area their home including the Laysan Albatross, Red Footed Booby and the Hawaiian State Bird, the Nene Bird, often found on golf courses. The ocean cliff in this area provides a safe habitat and breeding ground for many other species of Hawaiian seabirds. The Kilauea Point National Wildlife Refuge was established in 1885 by the US Fish and Wildlife Service and is noted by its towering lighthouse. We never had an opportunity to enter the lighthouse due to the size of the crowds and now as time winds downs, it doesn't look promising that we will. These may be a family of the Red Footed Booby sleeping in their nests. The fact that there's only a $5 admission fee per person with children under 15 free, this low cost attraction is a huge draw for families traveling with children. Where in Hawaii can a couple with two children enjoy such a venue for $10? Many birds flock to the cliffs in this area. For us, having the opportunity to see the lighthouse, take photos and enjoy the wildlife refuse was all we needed for an pleasant experience. Entering the lighthouse itself wasn't as important to us as seeing the surrounding area. We'd have enjoyed hearing the tour, especially with our friend Alice who conducts tours on Wednesdays. Instead, wandering the grounds taking photos, hearing the sounds of the surf slamming into the ocean cliffs along with the myriad of calls from the many birds, was all we needed. As for the geography of the area, Kilauea Point is a narrow lava formed peninsula which protrudes for the northern shore of Kauai, a short 15 minute drive from Princeville. Its obvious that the lighthouse has been well maintained. The land was purchased from the Kilauea Sugar Plantation Company (tomorrow, we'll be writing about sugar plantations in Kauai)in 1909 for $1. Construction plans went into play with decisions made to deliver supplies to the point by boat when there was a serious lack of roads in the from the Nawiliwili Harbor. View from the railing at the entrance to the Kilauea Point National Wildlife Refuse. The Nawiliwili Harbor is 1.9 miles south of Lihue, where the airport is located and the cruise ship, Norwegian Pride of America, docks for tours every Friday. Every Friday evening around 6 pm we can see this particular ship sail away from Kauai after the day's tours have ended. After four years of planning, construction began in July 1912 and the lighthouse was dedicated on May 1, 1913. The tower is approximately 52 feet high and built in the Classical Revivial architecture style of reinforced concrete. Distant view of the lighthouse. "The upper portion has a steel circular walkway with handrail. The lens one of only seven second-order Fresnel lenses remaining in a lighthouse in the US. Barbier, Bernard, and Turenne manufactured the lens in Paris, France. The 9,000-pound (4,100 kg) lens floated on mercury and compressed air. The lens was rotated by a system of pulleys powered by weights that needed to be reset by an operator every 3.5 hours. A radio beacon was added in 1930, and with the added generator the light was changed to be powered by electricity. Originally 250,000 candle power, the light reached 2,500,000 candle power in 1958. The station was manned until 1974 when it was automated. In February 1976 the light was moved to a nearby smaller tower and the tower was sealed. 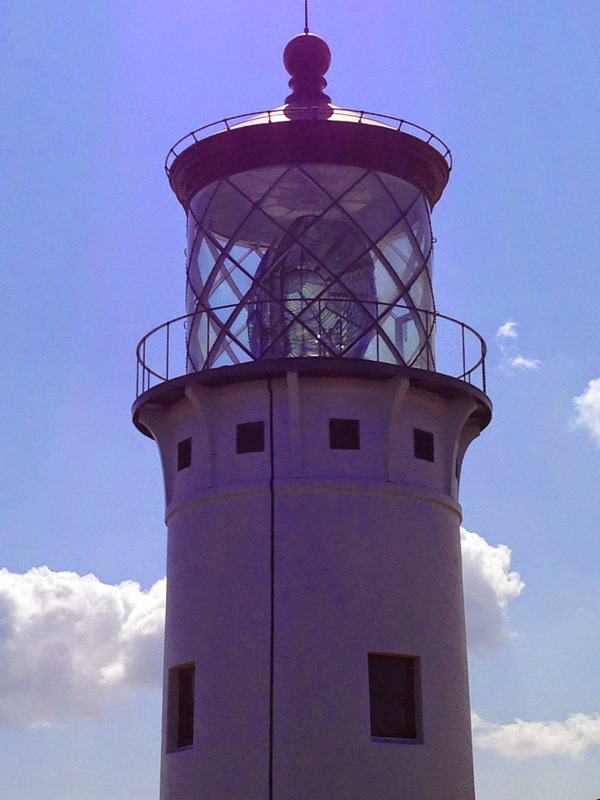 It was one of the last lights converted to automation by the United States Coast Guard in the Hawaiian Islands. The radio beacon was replaced in 1956, and then in the 1980s converted to a visitor center. On October 18, 1979 it was added to the National Register of Historic Places listings in Hawaii as site 79000759. The historic district included 31 acres. Ocean view from the grounds. "In 1985 the Kīlauea Point National Wildlife Refuge, starting with the original Coast Guard Station, and then expanding to preserve the surrounding habitat. A new visitor center was built in 1988. The buildings were damaged by Hurricane Iniki in September 1992, but repaired. The visitors center is operated by the Kilauea Point Natural History Association. Starting in late 2008, the group raised funds for restoration of the lighthouse." The lighthouse tickets were sold out. Waiting for the next tour would have required a 90 minute wait. The lighthouse and wildlife refuse will surely continue to be a great source of interest for tourists to Kauai for years to come. The love, pride and care the citizens of the state of Hawaii provides for all of their national treasures is evidenced in the preservation of the beauty and nature bestowed upon these magical islands. Although tickets were sold out to enter the main area of the lighthouse, this museum area was open to the public. Have a fabulous Friday and Mother's Day weekend. Make it special! You'll never regret any effort exercised in honoring moms. A display area at a restaurant, Le Jardin, which we frequented in Marrakech. On this date last year we were leaving Morocco in one week. For details, please click here.